I find myself in the company of woo, and as a skeptic it is bringing me some grief. It’s all about homebirth – planning to deliver a baby at home, attended by a midwife, rather than in a hospital. Deena and I came to homebirth through an examination of the evidence. (Here’s a discussion I participated in on the Bad Science forums before Kaia’s birth.) We were convinced, by scientific studies and analyses, that planning a home birth here in the UK was at least as safe as planning a hospital birth, given a competent attendant and a handy hospital in the event of complications. So we went for it. However, many people choose homebirth for less evidence-based reasons. They cite personal intuition, or the “naturalness” of it. Not just as reasons to prefer homebirth, but as evidence of its safety. At Edinburgh’s Pregnancy and Parents Centre (a haven for various types of woo, as well as useful support groups and great toddler activities), when we went to the “home birth support group” to relate our experiences and our evidence-based approach, it was alongside others promoting woo of various flavours as part of their support of homebirth. A recent post on homebirth at Science-Based Medicine has stirred up an epic-length discussion, with passionate defenders on both sides. I’ve participated, but fear that just being on the homebirth side has made me, in some people’s eyes, an advocate of woo. This is the problem: I agree with the woo-birthers that homebirth can be safe, but I disagree (passionately, vigorously) about why this is a legitimate position. And the disagreement isn’t immaterial. At the homebirth meeting, someone recommended homeopathy to treat post-partem haemorrhage. One of the most serious and potentially life-threatening complications of pregnancy, and she advised drinking high-priced water. That is dangerous advice, and I wish I’d been quick-thinking enough to respond persuasively (rather than sitting like a lump and grinding my teeth). What is a skeptic to do? On the one hand, having someone agree with me in one breath, and back me up with an appeal to intuition in the next, makes me want to revisit and question my beliefs that much more carefully. (That’s something a skeptic should be doing anyway, for all their beliefs, but who has the time?) On the other hand, to adapt Niven’s 16th law, “There is no belief so true that one cannot find a fool believing it.” Just because someone agrees with you for bad reasons doesn’t mean you’re wrong. I came to my belief about homebirth on the basis of the science, and I’m determined that only science will dissuade me. But there’s also the whole social side. Just as many of my fellow atheists wrinkle their brows at me when I say I go to church, many skeptics seem to do the same when I talk about homebirth. Atheists often assume that the word “church” is synonymous with supernatural beliefs and submission to a holy text, things that would feel alien in our Unitarian church. Similarly, many skeptics assume that, because it’s associated with modern medicine, hospital-based birth is inherently safer. I’m tempted to close by declaring, evangelist-style, that skeptics must beware of this tendency to take association as evidence. Its association with woo-birthers says nothing about the safety of homebirth; nor does its association with high-tech hospitals demonstrate the superiority of hospital birth. I promise to keep vigilant for evidence that might contradict my current beliefs. I promise to honestly communicate any changes of position that such evidence might lead me to. I promise to avoid being swayed by other people’s assumptions (whether or not they are skeptics). I promise to make every effort to pin my beliefs to the evidence, and nothing else. Since my March article about free will, I’ve learned that my position – that having free will is consistent with a mechanistic model of the universe (with or without quantum uncertainty thrown in) – is known as compatibilism. I recently read Thomas Pink’s book, Free Will: A Very Short Introduction (from the excellent Very Short Introduction series put out by OUP) – and so I now fancy myself knowledgeable enough to connect my own casual ponderings with the great web of philosophy. The position Mike took in his article is known as scepticism (in the context of free will, a combination of incompatibilism and a belief in causal determinism – not to be confused with other, more general forms of scepticism). A FREE-MAN, is he, that … is not hindred to doe what he has a will to … from the use of the word Free-will, no Liberty can be inferred of the will, desire or inclination, but the Liberty of the man; which consisteth in this, that he finds no stop, in doing what he has the will, desire, or inclination to doe. The quote is from p65 of Pink’s book, and it’s by 17th-century English philosopher Thomas Hobbes. I wouldn’t go so far as to call myself a Hobbesian – he wrote about more than just this, and I don’t know if the whole of his philosophy would appeal to me. But I tend to agree with this quote. Note that this passage makes no claims about what it means for someone to “have a will to do” something. One thing I like about compatibilism is that it does not rely on a particular model (deterministic, non-deterministic, etc) of the universe. Wikipedia article on Free Will. Is Saint Andrew’s Day controversial? A few weeks late, I have come across this exchange on the merits of celebrating Saint Andrew’s Day on the 30th of November as a national day for Scotland. 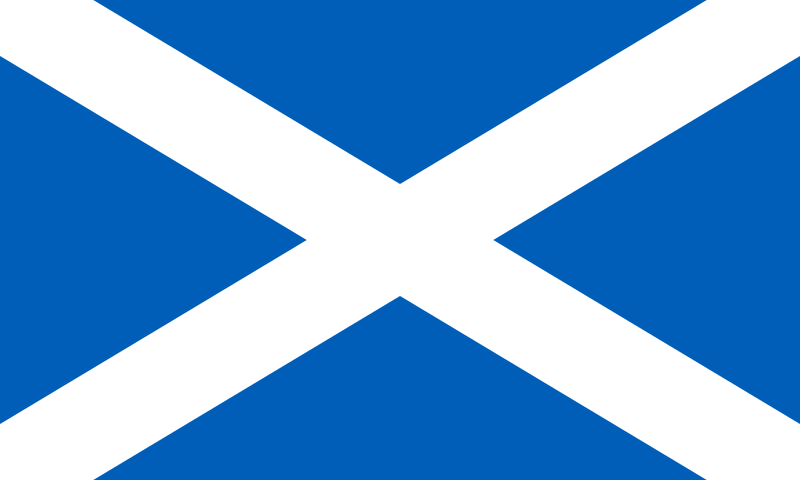 Saint Andrew was said to have been crucified on an ‘X’-shaped cross, which gives us the saltire in the modern Scottish flag (pictured above). His apparent connection with Scotland is that some of his relics were brought here after his death, and so he is considered the patron saint of Scotland. In the article from the Herald, Gordon Ross (treasurer for the Humanist Society of Scotland) argues that (a) Andrew has no demonstrable connection to Scotland (he’s patron saint of many other places as well), (b) it is primarily a religious tradition, which implicitly excludes the many non-Christian people in Scotland, and (c) we have plenty of other days with more genuine merit, to celebrate Scotland as a nation. Opposing him is Azeem Ibrahim, who argues that religion isn’t a serious part of Scottish Saint Andrews Day celebrations, and that the inclusive celebration of Scottish awesomeness is what the day is about. * I feel I should point out this post by Cath, in which I learned that even very conservative Christians don’t necessarily observe Christmas. This doesn’t change the fact that it’s historically a religiously-motivated festival, but it does somewhat derail the assumption that Christianity and Christmas necessarily go together. ** I should also acknowledge that Saint Andrew’s Day is not a huge thing, even in Scotland. In fact, my main experience of it is the free admission to the castle, and perhaps token acknowledgement in the media. So it’s a very different issue in many ways from Christmas. But the parallels are intriguing. *** Also, I should acknowledge a certain personal bias: Saint Andrew’s Day is also my birthday. It’s quite nice to be offered free admission to national monuments on your birthday. Saltire from Wikimedia Commons. Public domain. Why should humanists be in chaplaincy? Humanitie, the quarterly magazine of the Humanist Society of Scotland, has a new issue out. Once again, Mike and I present our rather different perspectives – this time, on the relationship between humanists and chaplaincy. Don’t forget to read Mike’s column over at his blog. I was recently asked a question about the place of humanists in chaplaincy life. In a chaplaincy, even an inclusive multi-faith chaplaincy, most people are religious. To what extent is it worthwhile and appropriate for humanists and other non-religious people to seek a place in chaplaincy? The answer is obvious to me. Clearly, though, some religious people and even many humanists don’t see things as I do. So here is my take on it. First, some background. Our university chaplaincy is very deliberately open to students and staff of “all faiths and none“. My earliest experience with the chaplaincy was when I was first learning and reading about humanism, and coming to realize that it reflected a deep part of my identity. I started looking for like-minded people, for a community to connect with. I had heard of the chaplaincy and its openness to people of no religion. I visited the chaplain and asked if she knew of any humanist groups at the university. She didn’t, but she thought it would be wonderful if there were a group. She also pointed me to the Humanist Society of Scotland (HSS), which has an Edinburgh group. There is a whole story following on from that – of attending an HSS philosophy book group, of meeting another humanist student, of forming a student group with him that has become far more active and successful than I expected – but for now let’s look at that first move on my part. Why did I go to the chaplaincy in search of humanists? First, there was my awareness that the chaplaincy branded itself as inclusive – they reach out not only to religious folks, but to folks like me. Second, for all that some humanists like to distance themselves from religious believers, there is a crucial feature that we share. Humanism is a framework for seeking meaning, for defining an ethical stance, and for sharing inspiration and expressing awe. For most religious people I’ve talked to, their religion does just the same: it provides meaning, defines ethics, and it is the lens through which inspiration and awe are experienced and shared. Also, perhaps even more importantly, both humanism and religions are identities around which human communities gather. So humanism is to me as religion is to religious folks. Even then, new as I was to humanism, I could see that. So it seemed obvious that the chaplaincy – a place for religious folks to meet like-minded people, a place for people to go for spiritual counselling, and a place that explicitly included non-religious people in its remit – was the right place to look for humanist groups at the university. And of course, that answers the question I opened with too. If chaplaincy is an obvious place for a lone humanist to go in search of kindred spirits, then chaplaincy is an obvious place for a humanist group to be connected with so that those lone humanists can find us. Yes, there is the Internet. Yes, there are other avenues for us to find one another. But that’s no reason to shut such an obvious means of connection. Besides, the sort of personal bond that people visiting the chaplaincy tend to seek is not something that can be transmitted through a computer screen. Of course, there is more to the chaplaincy than just finding folks like yourself. There is also the inter-faith element*. The idea of people of different backgrounds coming together to discover common ground. And I think that’s incredibly valuable. It’s something that’s lacking from a lot of the “culture war” discussions that get headlines. It’s important that humanists are involved in that as well. True, I may think that the other guy’s god is imaginary. True, he may think that I’m destined for hell if I don’t come to believe as he does. But equally true is the fact that we both value compassion. We both try to buy products whose production doesn’t exploit the vulnerable. We both try to act in ways that will preserve the planet for the next generation. We both strongly believe in each other’s right to believe as we will. Stuff we can draw on to make the world a better place, together. That’s why humanists should be involved in chaplaincy, and in other inter-faith endeavours. * Yes, I know, the term inter-faith is problematic for people like us, who consciously set ourselves apart from religious faith. It is also often used in a manner that really does exclude us. But until you can come up with a better term for a meeting of religious and non-religious worldviews, and show that other people will use and understand it, it’s better than nothing. ** A Unitarian church may do the same, but I don’t have enough experience at one yet to say for sure. It’s that time of year again, when the Cosmic Calendar brings almost daily events to reflect on. Today we see the Cambrian Explosion (about 540 million years ago), and the first vertebrates (around 534 million years ago). See the list of upcoming events in the sidebar on the right for the next 5, or go to the Google Calendar for the whole schedule. I’m still working out, for myself and my family, how to integrate the Cosmic Calendar into personal holiday traditions. I like the idea of building some sort of advent calendar around these last couple of weeks. How would you go about that? Would you used biologically-themed sweets? Toys? Snappy passages from The Ancestor’s Tale? I’d also like to fill in the blank days – the 20th, 24th, 25th, and 29th. I’m sure things were happening during these periods – every day represents about 37.5 million years of time, after all. But the big-ticket events like the first amphibians, the first birds, etc just haven’t happened to fall on those days. Would you like to participate? Do you have any thoughts for things to include in the Cosmic Calendar? Corrections on the dates I’m using? Other ideas? Please let me know! We have an innate tendency to psychological essentialism. Bruce Hood articulates this tendency well (see his book Supersense). His most vivid example is the serial-killer’s shirt. If you are given a nice shirt – one that fits well and suits your style and wardrobe – and told that it once belonged to a serial killer, how will you react? Most people will avoid the shirt – even avoid touching it. Of course, the shirt contains no “serial-killer essence”, but the association sparks something deep our psychology: we want to avoid objects that are associated with bad things. This was probably hugely adaptive in our evolutionary history: if you avoid touching things that have been handled by, say, a seriously ill person, you are less likely to become infected yourself. It doesn’t matter if the reason you avoid them is rooted in an accurate knowledge of the germ theory of disease or an improbable metaphysical notion of guilt-by-association – if it saves your life and is affected by your genes, it will give you a selective advantage over people without the trait, or with a weaker version of the same trait. Essentialist psychology provides a compelling explanation for why people would believe in certain immaterial properties of matter even if the universe is completely material. Which leads some philosophical naturalists (humanists, atheists, etc) to smugly think that we’ve risen above the illusion: we see through the illusory sense that our instincts push us into. We aren’t tricked into god-belief or imagining a life after death. I was playing with Kaia (my 2-year-old daughter), and she told me that her doll needed a nappy change*. As an expert, I was invited to conduct the procedure. I used a nose tissue to wipe the doll’s bottom. When I went to put the tissue back in my pocket (for future use), I was momentarily overcome by my inner essentialist. I had a strong sense that the tissue was unclean. All simply because of an act of imagination! I quickly realized what was happening, and put the tissue in my pocket anyway. In fact, once I became conscious of the illusion, it quickly dissipated. Thank goodness for skepticism. I wonder if I would have recovered as quickly if I had not, a few years ago, attended a talk here in Edinburgh given by Bruce Hood. Have you ever had a “silly essentialist” moment like this? How did you react? How did you feel once you realized what was going on? * I feel I should point out that this wasn’t one of those modern imagination-free dolls that actually produce wet nappies. It’s not that I don’t have a discipline. I do, but it’s like so much of what Unitarian Universalists do—my wife Deb and I have cobbled it together for ourselves over a couple of decades. For those hard-nosed skeptics among you who think that “spiritual practice” is simply a euphemism for rituals reinforcing supernatural beliefs, with no real effect on anything, I strongly recommend you give his article a read. You may not decide to try out his solution, but at least you’ll get an idea of a very humanist approach to spirituality and spiritual practice. So what is this do-it-yourself discipline my wife and I have been practicing for 21 years? The heart of it is very mundane: We talk to each other. I don’t know if Doug and his wife are “religious” (in the sense of believing in some supernatural reality). But the practice that he describes sounds to me like a well-grounded, practical, and enjoyable way to deal with the emotional (and other) issues that arise in daily life, and to appreciate life’s events as they come. To what must we aspire, and why? Okay, I understand that the whole “One source” bit is consistent with the rest – he’s not doing a U-turn at the end. But it’s unnecessary. Yes, fame and recognition are fleeting. Yes, living for eternal glory is a futile pursuit. Yes, it is enough to aspire to think clearly, do good, and speak truth. And an even temper is certainly something worth cultivating. But my even temper is not based on a belief in predestiny, in all things coming from a common source. It is simply based on the observation that level-headedness is the most powerful frame of mind from which to advance my understanding and improve my lot and that of my fellow humans. Postscript: I have discussed this with Darren, the mutual acquaintance who introduced me to Marc. Darren has spent more time with Marc and his crowd, and was able to cast the “one source” stuff in a light that I find easier to get on board with. I hope to discuss this (or perhaps invite Darren to tell you himself) in the not-too-distant future. This is a further entry in a back-and-forth between me and bettynoirbettyblanc (henceforth “Betty”), on evolution and Richard Dawkins. It began in this post of hers, to which I responded here. She followed up with a response here. The following will make more sense if you have read those posts first. Betty, I can certainly understand your dislike of Richard Dawkins. He often neglects to soften his critique of religious ideas (individually and collectively), and it is natural that many religious people feel that he misrepresents them. Some of their complaints – your complaints – are justified. However, I feel that your response ignores or misses many of the key points I was trying to convey, and exaggerates Dawkins’ faults beyond reason. First, I did not accuse you of denying evolution. You will notice, if you look again at my post, that I direct my criticisms on that point at creationists.The language of your original post leaves plenty of room for people to assume that you are more sympathetic to the creationist perspective than the scientific perspective, but I was (and continue to be) careful not to pigeonhole you unjustly. These outreach biologists (Dawkins, Gould, Wilson, etc) don’t make arguments of the form “I believe this, and I’m and expert so just take my word for it.” They make arguments of the form “Here’s some evidence. Here’s why it supports evolution.” With plenty of references to original research so that you can independently verify their claims if you don’t trust them. The Archbishop of Canterbury has no problem with evolution, nor does the Pope (give or take the odd wobble over the precise palaeontological juncture when the human soul was injected), nor do educated priests and professors of theology. The Greatest Show on Earth is a book about the positive evidence that evolution is a fact. It is not intended as an anti-religious book. I’ve done that, it’s another T-shirt, this is not the place to wear it again. Bishops and theologians who have attended to the evidence for evolution have given up the struggle against it. Some may do so reluctantly, some, like Richard Harries, enthusiastically, but all except the woefully uninformed are forced to accept the fact of evolution. Note that he’s explicitly stepping out of his role as a critic of religion in this book. First, it is accurate inasmuch as both holocaust-deniers and evolution-deniers reject the overwhelming preponderance of evidence in favour of a position that is based entirely on ideology. A better analogy, which shares this important characteristic while not being so offensive, might be to moon-hoaxers – people who believe that humans have never stepped on the Moon, and that the Apollo landings were an elaborate deceit. I can only respond that I have never come across this attitude, either explicitly or implicitly. As I said in my post, the biologists I’ve read point to the evidence, explain how it was interpreted, and draw their conclusions. The claim, then, is “we have followed the evidence, they have not”. Is this smug? Perhaps, but only to the extent that anyone is smug who defends one position based on the evidence, in the knowledge that some people sincerely hold another. I realize that you are not interested in getting into a debate over evolution, and I don’t intend to engage you in one. I am not a biologist, after all, just a fan of science. For all that I sometimes disagree with the tone (and occasionally the content) of his writings, I feel that you have misrepresented Dawkins in your posts, Betty. He is not a diplomat, but he is not the mean, attention-mongering anti-theist that you make him out to be. He works together with religious people on causes of common interest (as noted in the aforementioned excerpt from his new book). He acknowledges the literary value of the Bible (in The God Delusion). He objected to the title of his BBC documentary, The Root of all Evil, because he recognizes that religion is not the root of all evil. Of course, he remains an atheist. He has reasons for his position, and he shares them in books and articles. He makes money from his writing. You are free to continue to dislike him for this or any reason. You are even free to be skeptical of evolution if you are so inclined. But I implore you, if you do read anything he writes, to do so with a more sympathetic eye. Give him the benefit of the doubt. He may disappoint you in places, but I think it will be far less frequently than you expect. In a move reminiscent of the very successful Australian Skeptics open letter to pharmacists, the Merseyside Skeptics Society has issued an open letter to Boots pharmacies. This is in the wake of a parliamentary subcommittee meeting on the status and labelling of homeopathic remedies sold in pharmacies (“chemists” in this country). If you have time, check out the transcript here – a long but interesting read. (Thanks to Mike for the heads-up.) Here’s Ben Goldacre’s summary, as one of the people who gave evidence at the meeting. Boots sells homeopathic products. By association, it lends medical authority to these products – which have been demonstrated, so far as good research is able to demonstrate, to be medically indistinguishable from placebos. That is, they are not real medicine, and do not replace real medicine. The will not protect you from malaria; they will not protect you from H1N1. They won’t even cure your headache. If your headache does get better after homeopathy, there are three much more likely explanations: (1) it was a random coincidence (unsatisfying, but sometimes the world works that way), (2) it was going to get better anyway (you can’t tell this from a single case, but a large study of many people could), or (3) your belief in the treatment had a real effect on your malady (a very cool possibility – see Ben Goldacre’s book Bad Science for more, or go read his blog). Mr Bennett: We do indeed sell them and there is certainly a consumer demand for those products. Q4 Chairman: I did not ask you that question. I said do they work beyond the placebo effect? Mr Bennett: I have no evidence before me to suggest that they are efficacious, and we look very much for the evidence to support that, and so I am unable to give you a yes or no answer to that question. Q5 Chairman: You sell them but you do not believe they are efficacious? Mr Bennett: It is about consumer choice for us. A large number of our consumers actually do believe they are efficacious, but they are licensed medicinal products and, therefore, we believe it is right to make them available. Q6 Chairman: But as a company you do not believe that they necessarily are? Mr Bennett: We do not disbelieve either. It is an evidence issue. They don’t have good evidence that they work, but people want to spend money on them. This is a disgustingly cynical attitude toward the public, and toward Boots pharmacists’ own responsibility as front-line dispensers of medicine. I include the open letter below. I will also be contacting Boots. If you are interested in this issue, I encourage you to do the same. Other blogs and websites have noted this, including Skepchick, The Not Quite So Friendly Humanist, Bruce Hood, Bad Science, A Glasgow Skeptic, RichardDawkins.net, Bad Homeopathy, and New Humanist. Also, various newspapers have picked up on Boots’ strange position: The Telegraph, Daily Express, Daily Mail, Guardian (and Ben Goldacre again, and their liveblog of the meeting), Times, and Mirror. Feel free to comment and link to any I’ve missed.